Sitting at just over 6,000', Airmen Peak is not exactly one of the tallest summits in the Catalinas; yet this little peak boasts some beautiful views! Perhaps it's the variety of being situated partially above and partially below many of the surrounding peaks – in combination with many awesome rock formations – that make it so unique and interesting. It almost felt like a combination of the Chiricahuas, Superstitions, and Yosemite blended together. The name of the peak is also an interesting story. In 1986, retired Air Force Chaplin Lawrence Tagg wrote to the United States Board on Geographic Names, proposing that Wrong Mountain in the Rincons be renamed to Airmen Memorial Peak in honor of those who died in the many military aircraft accidents in the Tucson area. Since the name Wrong Mountain was already well established, [and had existed since at least 1910], the request was denied. Instead, a peak in the nearby Catalinas was designated Airmen Peak, "Named in honor of all airmen who have died in military aircraft accidents from the greater Tucson area." Finally, one neat thing to look for in the summit log: I found an entry from 9/14/02 written by Marty Tagg. In his short note, he states that his "dad, Larry Tagg, named the peak" and that he was trying to find the easiest route up so his dad could come up next time. If only I wasn't distracted by other people wanting to sign the log, I would've remembered to look and see if his dad's signature was somewhere in the log too. Regardless, I sure hope his dad was able to make summit! If you do a Google Search on the name of this peak, you'll see there are many options. I did this hike with a group as an out and back, but there are some nice loops and canyon combos that can be used to create an even longer hike if desired. However, be forewarned: regardless of the route you choose, there are no established trails to the top of Airmen Peak [and no trails anywhere near the peak for that matter]. To hikers experienced with bushwhacking / off-trail adventure, the 'brush-factor' doesn't get any easier than this one! The biggest offenders are shin-daggers [but for the most part, they are spaced very wide apart]. Occasionally, you'll encounter a small patch of prickly pear; and there was also an isolated, thin patch of cat claw that could be easily avoided. Depending on the route you choose, some of the slopes were a bit steep and a few of the experienced hikers mentioned that the footing would likely be loose and a bit tricky if the conditions were dry. However, with the soil a bit wet from rain and/or snow melt, the grip was excellent. The route I took kicks off from the Molino Basin Parking Area. You'll cross the road and then start down the Arizona Trail. 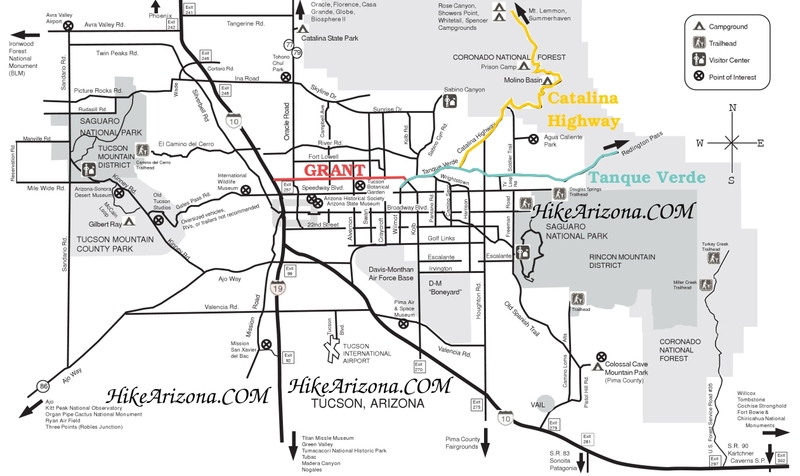 After a VERY short segment on the Arizona Trail, take an unofficial but well beaten route that splits to the left and follows a drainage upwards. I did not find the footing around the drainage to be at all tricky. With almost no brush and many solid, grippy rocks, it was very pleasant. From what I could see, it looks like it would be easy and fun to simply follow the drainage all the way up to the ridge and then ride the short ridgeline to the summit of Airmen Peak. The group I was with decided to break out of the drainage to the left, which can clearly be seen on my GPS tracks in topo view. Regardless, the going was still very easy. However, [since there are a few peaks in the area, all about the same elevation], the most difficult part could prove to be making sure you end up on the correct peak! Therefore, I would highly recommend following a GPS track OR at the very least use a GPS app like Route Scout that will least identify correct peak for you. In addition to the trailhead this is a large, popular campground and day use area. Parking for day use is immediately after turning into the Molino Basin. The trailhead is signed and takes off out of the day use area.